The main section of the window displays all of the XPilot servers (that have registered) around the world. You can double click on a server to start the game. You can join a specific team from the toolbar. The servers with the yellow circles have watches on them. 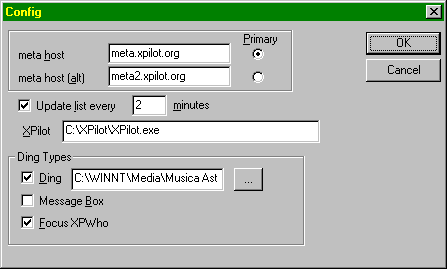 The Toolbar controls most of the actions of XPwho. Connect - Refreshes the display. Font - Changes the display font. Doesn't work. Should be disabled. Config - Brings up a dialog to set global options. Columns - Pick which columns you want displayed. Players - Shows all of the players as well as the servers. Watch - Per server toggle. Keeps this server sorted to the top. Ini - Allows separate ini files per server. Not functional yet. Ding - Perform special action when a player joins a server. Huh? - Brings up the about box. Help - Context help. Disabled. Home - Executes your default browser and loads the BuckoSoft XPilot page. Join - Launches XPilotNT and joins any team. Left mouse button over a ship to select it. Right mouse button over a ship will animate it (without selecting it). While the mouse is down over a ship, its name is displayed in the text. The currently selected ship has a green underline; i use the finger. The scrollbar changes which ships are displayed. If you don't want the shipbar displayed (most players settle into 1 name and 1 ship), you can turn it off from the view menu. The Config dialog box sets up XPwho. Meta Host. - You shouldn't have to change this. Meta Host (alt). - Alternate Meta host. You shouldn't have to change this. Primary. Selects which meta host to try to connect to first. Update list every - Check this box for automatic timed updates. minutes - How often to update the display. XPilot - Where the XPilot executable lives. This is set at installation and is really only useful if you want to point to a version you built yourself. Ding - play the specified sound.